The Makino Operator Platform has been designed and manufactured for a local Aerospace OEM for use within the precision machining facility. The solution is similar to existing staging already on site at the precision machining facility however this piece of staging features an angled segment which will allow it to match up correctly to the existing machine step. 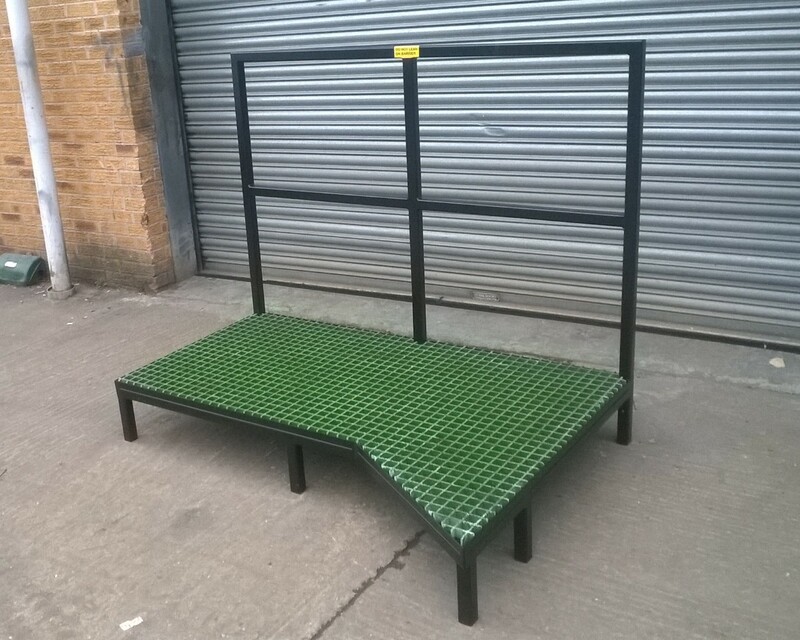 The Platform has been manufactured from 40mm x 40mm box section for the base frame and handrail with 25mm x 25mm angle to support the fibreglass anti-slip grating. Under the grating is a formed sheet metal drip tray to catch any oil, preventing it from causing a slippery floor surface around the machine. Hand rails drop in with a pin to secure, this allows the maintenance teams to remove the handrail for full access. The male end of the hand rail is on the rails to prevent any trip hazards when the rail is removed. The trolley has been powder coated in ripple black to give a hard wearing durable finish. Approximate overall size – 1650mm (L) x 1150mm (W) x 1300mm (H) to the top of the hand rail, platform working height will be 200mm.